Students and staff circled around a vibrant Japanese Maple tree at Student Apartments on April 24th to celebrate Arbor Day. Landscaping Services, Residence Life and Housing, and the Office of Sustainability co-hosted the ceremony in conjunction with a Campus Beautification Day celebration that was organized by Greeks Go Green interns. University Arborist Jim Mussetter, presented the ceremonial tree, a cultivar known as Acer palmatum ‘Shishigashira’ or “Lion’s Head.” Mussetter described that this specific cultivar was chosen for its slow growth and striking fall foliage of gold and crimson tones. As the first ‘shishigashira’ introduced to campus, the tree will be a seasonal focal point in the housing courtyard for decades to come. University Chaplain Tim Auman led a poetry reading before guests in attendance planted the tree. Immediately following the ceremony, students divided into groups, led by Greeks Go Green representatives, to pick up litter across campus as part of the Campus Beautification Day celebration. From small tools to cigarette butts, students collected litter of all shapes and sizes in an effort to Keep the Forest Green. Participants were recognized for their contributions: the first-year class turned out in the highest numbers as did brothers from Alpha Sigma Phi. After the clean-up, students were rewarded with at a cookout, including grass-fed burgers made from Grayson Natural beef, which was generously co-sponsored by Residence Life and Housing, Outdoor Programs, and Landscaping Services. 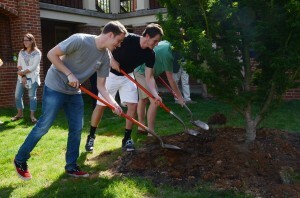 The fourth annual Arbor Day ceremony and the inaugural Campus Beautification Day service event exemplify Wake Forest University’s commitment to our Tree Campus USA designation by the Arbor Day Foundation.